Shoutouts to the GameFAQs Melee boards for playing a huge role in the editing process! Please refer to the index for further clarification on terms! Super Smash Brothers Melee is one of the most unique, deep, exciting and dynamic fighting games in existence. The game has an incredibly interesting background with extremely intriguing storylines and rivalries. There are so many classic moments that will be cherished forever by the fans of the game, such as the meteoric rise of Ken, who earned the title of “The King of Smash” and the MLG era, where Ken was finally challenged and pushed to his limits. Following the MLG era, Melee saw a decline in popularity due to the release of Super Smash Brother Brawl in 2008. However, Melee quietly remained alive and eventually saw a resurgence. This revival of Melee was characterized by a completely different metagame and five individuals that dominated the game for years: Mang0, Armada, Mew2king, Hungrybox and PPMD. Together, they became known as “The Five Gods of Melee.” This article series will focus on the story of these five players: their rise, their highs and lows, their rivalries and where they stand today. Upon the release of Melee in 2001, the game was largely played casually. By 2002 a few fans of the game became interested in playing competitively and a series of tournaments, known as Tournament Go, were founded. Ken famously won Tournament Go 4 in 2003, the first in the series that he had attended. This was the beginning of his dominance from 2003 until the beginning of 2006, where he won nearly every tournament he attended and rarely lost to anybody. One of the most notable exceptions was a tournament known as MOAST 3 in 2005, where he was defeated by his good friend Isai. His title as the best player was finally challenged in 2006, when a few new players; PC Chris, Korean DJ and Mew2king improved extremely quickly and began to beat Ken. This was the MLG era, as many of the large tournaments were run by Major League Gaming. Most of the players from the MLG era moved on after the release of Brawl and became largely inactive. However, one player continued to play Melee and hone his skills with the objective of becoming a perfect player: Mew2king. Jason “Mew2king” Zimmerman was the first god to rise and become a top level player when he began to challenge players such as Ken in 2006 and 2007. He mains Marth, Sheik and Fox. He is known as a perfectionist with an incredible work ethic, and has spent thousands of hours studying frame data and refining his combos. As a result, he has earned the title of “The Robot.” In addition, he is known as the master of Final Destination, one of the competitive legal stages in Melee. His combos with Marth on Final Destination are so devastating that he consistently zero to deaths Fox and Falco players with one grab. Mew2king is also the greatest edgeguarder of the game, as being offstage against him almost certainly means death. Mew2king’s rise began in 2006, where he began to place in the top 8 at MLG tournaments. By 2007, he was known as the best player in the world. He won several major tournaments that year, including Cataclysm 3, EVO East, MELEE-FC Diamond and EVO West over top players such as PC Chris, Cactuar, ChuDat and KoreanDJ. However, he failed to win the largest tournament of the year, EVO 2007, where he was upset by an up and coming Jigglypuff player named Mang0. Jigglypuff became Mew2king’s achilles’ heel for the next few years, and continues to be a difficult character for him to play against. 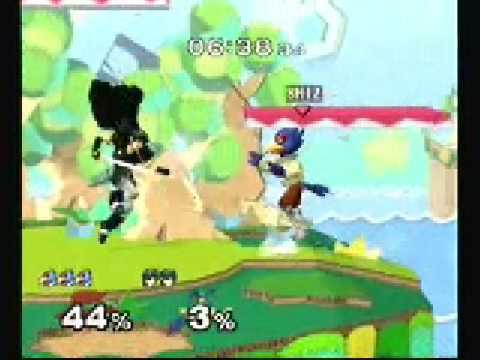 Going into 2008, Mew2king aimed to reclaim his title as the best player, however, he was defeated by Mang0 in two straight sets in Grand Finals of Pound 3, an American national tournament. As the set progressed, Mew2king became increasingly frustrated and discouraged. He has always been a very calculating player, which is extremely useful against a character like Fox. It is very easy to combo Fox, and once Mew2king finds an opening, he can simply follow his flowchart combos until Fox is dead. However, Jigglypuff cannot be comboed like Fox. To defeat Jigglypuff, a player must win neutral exchanges and read the other player’s movement. This is a direct counter to Mew2king’s standard and predictable playstyle. It is the reason for which he struggled against Mang0’s Jigglypuff and later against Hungrybox, and he never fully overcame his Jigglypuff problem. After his defeat at Pound 3, Mew2king was no longer considered the best player in the world, with Mang0 taking that title. However, he was still considered a top player. For the next five years, he consistently won regional tournaments and placed in the top 5 at nationals. One of these nationals was Revival of Melee in 2009. At the time, Brawl was at its peak in popularity, and Melee had very few national tournaments. It can be argued that one set at this tournament played a pivotal role in Melee’s return to popularity; Loser’s Finals. Mew2king was fresh off a loss to Mang0 and was playing against a top player by the name of DaShizWiz. He went up 2 games to 1 in the first 3 games of the set. In game 4, DaShizWiz was winning 3 stocks to 1 and it looked certain that he would tie up the set. However, Mew2king completed an incredible comeback to win the game and the set, leaving the crowd extremely shocked and excited. He advanced to Grand Finals, where he was swiftly defeated by Mang0. Despite this fact, Game 4 of Loser’s Finals was the most memorable part of the tournament, and it is cherished by Melee fans around the country. It also brought a lot of new fans to the Melee community, with the Youtube video going viral. Mew2king may have failed to win Revival of Melee, but he succeeded in saving the game. From 2008 onwards, Mew2king became known as a “Gatekeeper God” as he would regularly defeat the best non-gods, but had trouble beating the other gods. He has a negative record against the other four gods, including an abysmal 1-12 record against Armada. Playing against Armada has been the biggest mental hurdle of his career. Although many players have gotten into Mew2king’s head and discouraged him, none match the challenges of Armada’s brutal Peach. His lone win against Armada was at SKTAR 3 in 2014, a tournament in which Armada had recently returned from retirement. Nonetheless, Mew2king celebrated that win harder than any other victory in his career. Hungrybox’s Jigglypuff has also given him a significant amount of trouble in the past, as he has a 15-27 record against him. 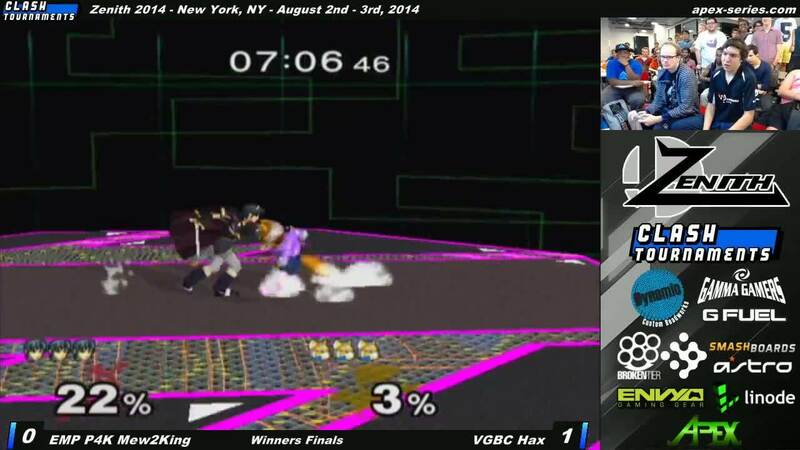 However, Mew2king briefly overcame Hungrybox’s mental block at The Big House 3 in 2013. In the latter half of 2013, Mew2king saw a resurgence that led him to win every tournament he entered. This period of dominance is known as “The Return of the King.” It was a great time for Mew2king in many ways. He won multiple sets against Mang0, Hungrybox and PPMD during that period, players who he rarely beat before. Moreover, he was having fun and genuinely enjoying the game, a rarity for him. His poor mentality and his discouraged faces were replaced with smiling and laughter. It began with The Big House 3, where he defeated Hungrybox and PPMD in dominating fashion to win the tournament. This marked the first and only tournament that Mew2king won with two other gods in attendance. This was followed up with several wins at tournaments with one other god in attendance. At Pound V.5, he defeated Mang0 3-0 in Winner’s Semis and 3-1 in Grand Finals. At Revival of Melee 6, he beat Hungrybox in Winner’s Finals and Grand Finals to win the tournament. His strong finish in 2013 earned him rank #3 on MeleeItOnMe’s (MIOM) 2013 SSBMRank, only behind Armada and Mang0. Mew2king entered 2014 as the favourite to win the year’s first supermajor: Apex 2014. However, he was double eliminated by PPMD, losing 0-3 in Winner’s Finals and 1-3 in Grand Finals to finish 2nd place. This proved to be a consistent theme throughout the year, he came close at several large tournaments but always fell to one of the gods. At MLG Anaheim, Mew2king had been playing amazingly well and defeated PPMD in an emotional Loser’s Semis set. However, he could not overcome the impenetrable Armada barrier in Loser’s Finals, and finished 3rd. The closest Mew2king has come to winning a supermajor was at The Big House 4, where he defeated Mang0 3-0 in Winner’s Semis and a rapidly improving Swedish player named Leffen 3-0 in Winner’s Finals, but lost two successive sets to Mang0 1-3 in Grand Finals. In many ways, The Big House 4 was a representation of his career. He has always been an amazing player, but falls short during the most intense moments. Mew2king finished the year ranked #4 on MIOM’s 2014 SSBMRank. Mew2king started 2015 poorly by his standards, as he failed to make top 8 at Apex 2015 and finished 7th at Press Start. The first half of the year was riddled by several problems that led him to be fairly inactive, including depression and various incidences involving the organization that he co-founded: Most Valuable Gaming. Fortunately, his performances improved significantly in the second half of the year, where he finished 2nd at Paragon Los Angeles, 3rd at The Big House 5 and 3rd at Smash Summit. In addition, he won Smash at Pax against the #3 player in MIOM’s 2015 SSBMRank, Leffen, where he dominated him with 3-0 victories in both Winner’s Finals and Grand Finals to win the tournament. In MIOM’s 2015 SSBMRank, Mew2king was #5. Mew2king has one of the strongest legacies in the SSBM community. He has been a top player for nine years and continues to be a threat to finish top 3 at any supermajor. Unfortunately, he is lacking a victory at a supermajor tournament in the god era, and has the least significant wins of all the gods. The Big House 3, his biggest win, only had two other gods in attendance, while every other god has won at least one tournament with four or more gods present. When looking back at his career, one can only imagine how things would have been had he won The Big House 4, which could have been a career defining victory. He would be viewed very differently with such a victory, perhaps in the same league as Mang0 and Armada. Nonetheless, Mew2king has had a wonderful career, and is rightfully known as one of the greatest players to pick up a Gamecube controller. Even today, he is a top level player capable of beating anybody, with the exception of the one player that has given him so much trouble; Armada. Ditto: A matchup in which both players are using the same character. I.e In fox dittos, both players are using Fox. Loser’s/Winner’s Bracket: Melee tournaments follow a double elimination style. If a player loses in Winner’s bracket, they still have a chance to advance through Loser’s bracket. The winner of Winner’s Finals and Loser’s Finals meet in Grand Finals, which decides the winner of the tournament. The player coming from Winner’s Finals only needs to win one set, while the player from Loser’s Finals must win two successive sets to win the tournament. Punish game: How well a player can convert a neutral win. If a player’s punish game is strong, they will have devastating combos out of a small opening in neutral. Tournaments: Tournament can be divided into four broad categories, based on how many top players are present. Sandbagging: Intentionally not trying, frequently done with low tier characters. Set: A set in Melee is a series of four stock games that are played between two players. The sets tend to be best-of-three earlier in bracket and best-of-five later in bracket. The set begins with a game that is played out on a neutral game. The subsequent games are played on a stage that is chosen by the loser, known as a counterpick.